It takes roughly about an hour to arrive in Jiu Fen from Yehliu. Basically the whole Taiwan consist of mountains and hills. 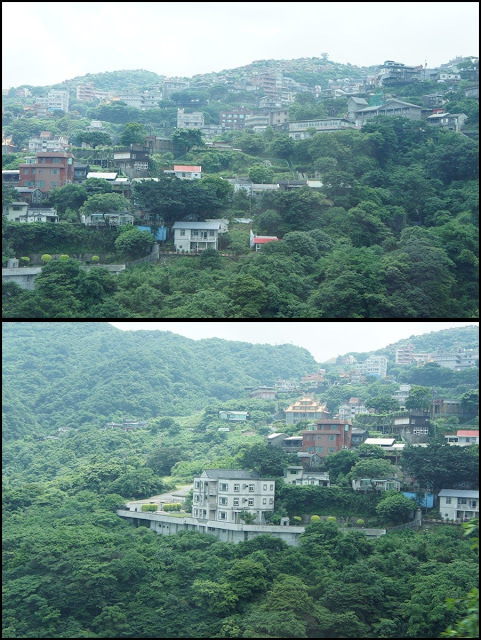 The view was filled with green scenery which is actually good and healthy for your eye sight. The weather there was pretty cold but not as cold as Genting. This village is known as Jiu Fen which means Nine Portions because previously there were nine families who lived in this area and as you all know, some history going on here and there. Just go google it up to read the history only if you're interested. Which I bet most of you wouldn't even bother to do so unless you are one of those people who plan to visit this place for your next trip. Basically the place was filled with shops selling food, souvenirs and pork sausages and also pork sausages and more pork sausages. The smell was too strong that I really felt like puking. Never in my life, smelt such strong 'fragrance'. I think that is what you get when all the pork sausages store reunite - indefeasible power! Jiu Fen is located by the mountains. Hence the shops were located uphill. I love how they decorated their shops. It really looks so amazing. Just like one of those ancient era. It makes me feel like I'm a traveller. Oh wait. I am a traveller indeed. Lunch was not covered by the tour agency on that particular day. So we had a free and easy lunch option. Which means - need to spend more money. However it was great to spend more money as we can eat anything we want and later on cry for being broke. What a lovely experience no? Hah! This is a must try hot stuff when you're in Jiu Fen. It is known as the Popiah Ice Cream. 2 tiny scoops of ice cream wrapped with some peanut fillings in it. 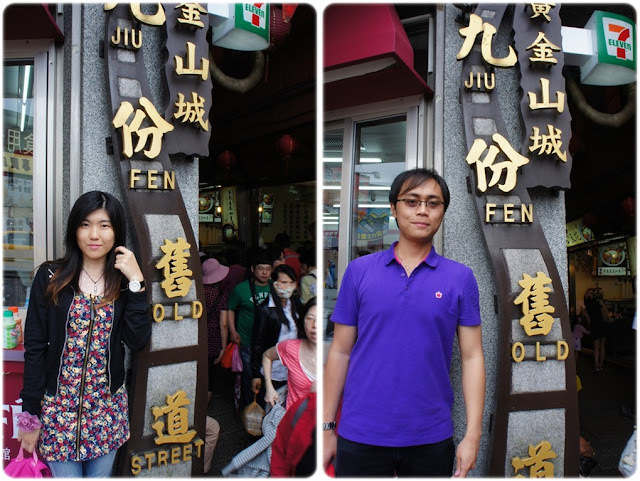 Then we went to the Niu Rou Mien ( Beef Noodles) shop for some heavy meal. Make sure that you order the one cost NT$ 90 instead of the NT$ 45 because the difference is that, the expensive one contains beef while the latter one does not have any beef at all despite the chinese name that sounds like as if there's a beef in it. LOL! According to the tour guide, this dish is quite popular here. 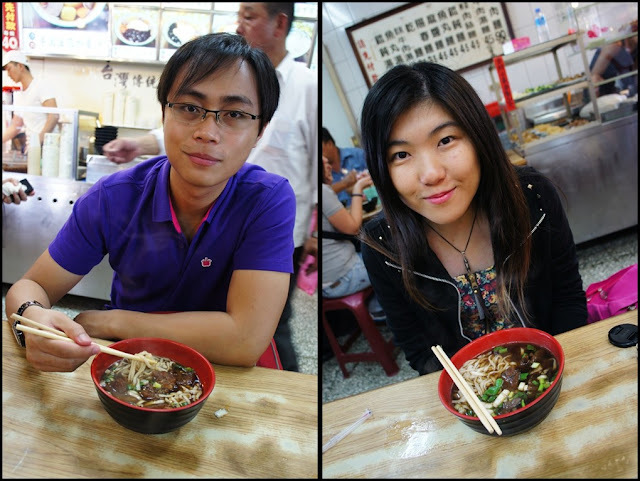 So the 2 poor lost soul (Mark and I) listened to the tour guide's advice and we ordered the NT$ 90 per bowl each. The beef was so thick and I was having a super hard time to chew and digest the food. Regret for ordering 2 bowls. Pffft! Both of us couldn't finish that 'thing'. We bought few Taiwan key chains there. Oh boy! Their cheapest key chain cost roughly about RM7+ there. I was looking high and low for key chains that cost NT$ 100 for 3 but to no avail. Next tip is that, you MUST NOT MISS this drink when you're in Taiwan. It is the combination of Vitagen and Yakult! I can't remember the price per bottle but I think it cost roughly about RM4 each. Dolls that I bought. Super kawaii max right? We spend almost 2 hours there. Around 1pm we proceed to our third destination which was The Lavender Cottage. That place was super awesome and indescribable. Shall blog about it soon.